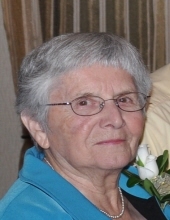 Mary Margaret Schmitz, age 87, passed away on Saturday, October 15, 2016. Mary Margaret was born on October 25, 1928 to Nicholas and Martha (nee Schueller) Wester. She was united in marriage to Donald Schmitz on September 16, 1950 at Lake Church in Belgium and resided, after their marriage, on the Schmitz Homestead. She was employed at Allan Edmunds Shoe Corporation as a Stitcher until her retirement in 1991. Mary Margaret served as Luxemburg Society Treasurer for many years, and was also Duchess in 1989. She was President and held various other officer positions with the Christian Mother’s Society and was a member of the Dacada Players with her husband, Donald. After retirement, Mary Margaret continued travelling around the USA as well as to South East Asia. She enjoyed traveling, gardening, ceramics, playing cards, crocheting blankets for the grandchildren watching the Packers and being with family and friends. Mary Margaret is survived by her children: Robert (Beulah deVera) Schmitz, Dennis (Janet) Schmitz, Tom (Nancy) Schmitz and Judy (Mike) Reiter; Grandchildren: Michelle Schmitz, Nicole Sophia Schmitz, Shannon (Chad) Casper, Crystal (Jason) Cram, Jolene (Morgan) Scribner, Lindsey (Jeff Edmunds) Schmitz, Eric (Ashley) Schmitz, Stacie (Matthew) Kersten, Chad (Jordan) Schmitz, Adam (Lois) Reiter, Matthew Reiter and Jenna (Ryan) Krueger, and 12 great grandchildren. Sister JoAnn Schmit, sisters-in-law: Ruth Wester, Darlene Wester, Mary Ann Wester, Adeline Schmitz, Lucile (James) Wester. Mary Margaret is preceded in death by her husband Donald Schmitz, brothers: Norman Wester, Daniel Wester and Arnold Wester sisters: Clarice Wester and Celine (Ronald) Krizek, and brothers-in-law, Harvey Schmitz and Jack Schmit. A Mass of Christian Burial will be held on Thursday, October 20, 2016 at Our Lady of the Lakes Parish - St. Nicholas Chapel (W4274 Hwy K, Random Lake) at 6:00 PM with Father Richard Cerpich presiding. Visitation will be held from 3:30 PM until the time of the service at 6:00PM. Mary Margaret will be laid to rest next to her husband at St. Nicholas Cemetery during a private family service the following day. The Family also would like to thank the staff of Harbor Campus for their dedicated care over the years. In lieu of flowers, the family would appreciate Donations which will be given to the Alzheimer's Association. To send flowers or a remembrance gift to the family of Mary Margaret Schmitz, please visit our Tribute Store. "Email Address" would like to share the life celebration of Mary Margaret Schmitz. Click on the "link" to go to share a favorite memory or leave a condolence message for the family.